The statistics that most small businesses fail within the first five years is a scary one. 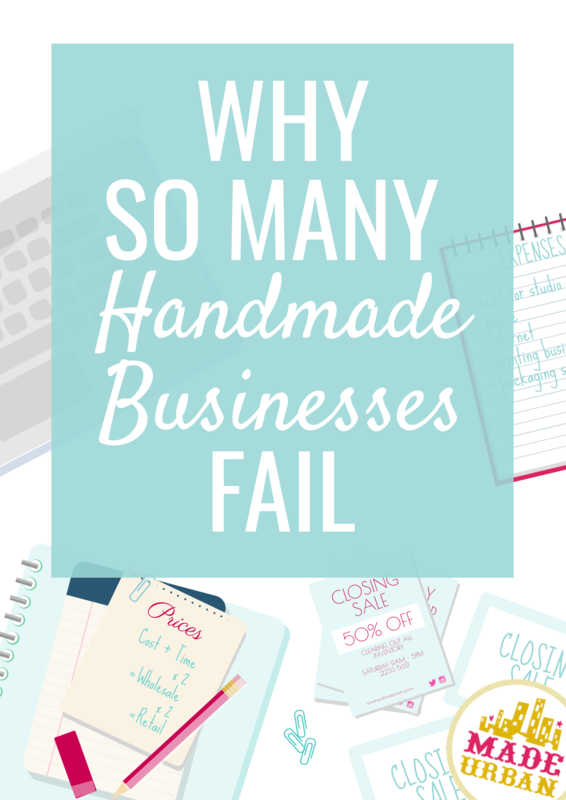 As much as I would love to chalk it up to a “theory” and not actual stats, the truth is, there are a lot of handmade business that don’t stand the test of time. Through Made Urban I am constantly discovering handmade businesses. I always hate stumbling across an article about an amazing artist, follow the link to check out their website and find that it’s down and their business closed. It doesn’t always mean it failed but most of us don’t start a business with the idea that it will be shut down within a few years. There are a number of outside factors that determine whether a business will stand the test of time or not but what’s important is that the owner is set up properly and maintains the passion and drive needed to push through the hard times. 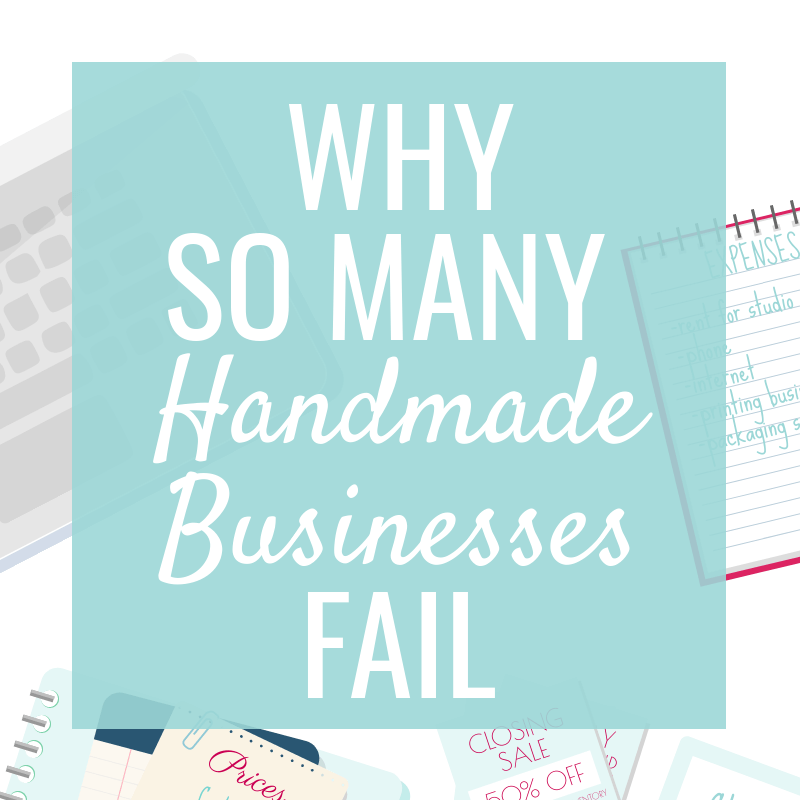 Here are 11 common reasons handmade businesses fail and pitfalls to avoid. As Kenny Rogers said: you gotta know when to fold em. Obviously, we believe an idea is a good one to start, or we wouldn’t take action on it. But what seems like a good idea on paper isn’t always successful once it’s put into action. Business and life are about unfolding. You don’t start in the same place you end up. There’s a path you follow with lessons and insight along the way. Small business owners can get into trouble when they know the sales aren’t there but are too stubborn to change direction because they want to stick with their original idea. Don’t hold onto an idea just because you think it’s great. It may be a great idea but a bad business idea. And if you’re on this venture to make money, then you have to be open to following the path that leads to money, even if it’s in the opposite direction you planned to go. Let the market shape your business. If you start a jewelry business but the sales aren’t there and you have more people at a craft show commenting on the beautiful tablecloth you made than on your jewelry, consider if tablecloths are your true calling. The market may be telling you that although your jewelry is nice, there’s a bigger opportunity for tablecloths. Or if posting to Facebook used to get you sales but no matter how much you post lately, you can’t get anyone to like your posts, let alone click on them…let go of Facebook marketing! Try something new. Learn the ins and outs of Instagram, try blogging and start getting people signed up for your newsletter. We can never be too attached to our ideas in business or stay stagnant. We have to take our egos out of it and be willing to do what’s best for our customers and our company. There will always be someone on your heels, trends will change and new techniques will arise. Keep moving, improving and adapting. A business without a brand has the feeling of a side business, one that hasn’t been operating very long and one that isn’t too serious. How comfortable would you feel buying from a business with an owner you felt didn’t have both feet in, might not know what they’re doing and could shut down at any time? Handmade businesses often are side ventures. But they don’t have to appear that way. Branding gives your business credibility and makes shoppers feel a sense of security and that they’re becoming a part of something unique. What if Burt’s Bees didn’t have the story of Burt selling honey on the side of the road? What if they sold lip balm using beeswax but other products used harsh chemicals and they tested on animals? What if they didn’t carry the honeybee yellow into all their packaging and graphics, their photos didn’t have a natural vibe to them or their models had caked on makeup and stiff hairstyles? Their backstory changes as the company grows and unfortunately, Burt is no longer a part of the company and it’s been bought by Clorox (which has quite the opposite branding). But the public perception of Burt’s Bees is that it’s a nature-focused brand. Branding can add professionalism and help your business stand out, even when you’re selling a product hundreds of other businesses are selling. Ask yourself this: if you found 2 businesses selling identical products, which one would you choose to buy from? Probably the one with the lower price. You’ll never keep a handmade business going by competing on price so it makes the decision easy: offer something different. People fall in love with handmade items because they’re unique and reflect the maker’s personality. And sometimes that unique experience comes from the branding and less from the product. Let’s go back to Burt’s Bees for a minute. Lip balms using beeswax and bath & body products using natural ingredients is nothing new or really all that unique anymore. It’s Burt’s Bees’ branding that made the company a success and helped them sell millions of products. Not a ground-breaking formula. You don’t have to invent a product no one has ever thought of or offer something completely different than any other business. Your unique selling position can come from your unique perspective, which has to be built into your brand. If that’s what it is for you, that’s great, but if you do in fact want it to be a business, you need to treat it as such. 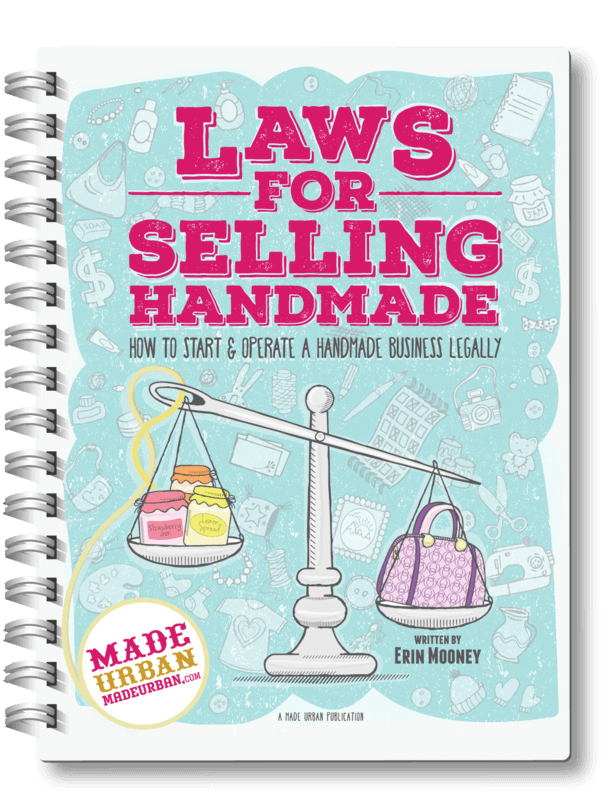 Most people fall into their handmade businesses, which is why they don’t take the steps they would if they were opening a restaurant or brick and mortar store. You make something as a gift, your friends tell you to start selling them, you sign up for your first craft show and go from there. It’s great to get excited and take action but be sure you take the time to write up a business plan, register your business, get the proper permits, draft a partnership agreement, set budgets, etc. Not only does this get you organized and set up for success, but it also forces you to be committed. When you invest the time and money it takes to get properly set up, you’re less likely to throw in the towel on a whim. Make your customers feel like it’s more than just a sale and it’s more than just a product they’re getting. Show them why it’s so much better and more fulfilling to buy from a handmade business owner than it is to buy from a big chain. Follow up to ensure they’re happy with their purchase and actually using the item. This can all be automated and doesn’t have to feel intrusive or bothersome to your customers. It’s all covered in HOW TO SELL BEYOND FRIENDS & FAMILY. Make use of your newsletter and keep customers in the loop of new products or promotions they might want to take advantage of. Your products should also planned with the idea of repeat customers and selling more than one item per transaction. I get it. I started my handmade business with the mentality of: the more products I have at my craft show table, the more people I’ll attract, the more choice they have and the more likely they are to find something to buy. It sounds good…on paper. But let’s imagine this theory applied to any other product or service industry that’s typically a one-person show. Do you think a singer would sell more CD’s if there were 12 songs on the album and each song was a different genre? I’d have to say no. How good could one person be at writing and singing country songs, rap songs, pop songs, punk songs, etc.? Not to mention, they wouldn’t really give the impression of a singer who has a strong identity and is being true to their style. They would seem as though they’re trying to make a quick buck. What if you came across a repair person who claimed they could repair your refrigerator, car and computer? Would you have complete faith that they could actually fix everything properly or would you feel more comfortable hiring a refrigerator repair man to fix your fridge and a mechanic for your car? Find the people you want to serve and choose a niche that appeals to them. Get comfortable with the idea that you can’t please everyone and everyone will not be your customer. Even the biggest companies in the world don’t try to carry products for everyone. If you want your products to sell with purpose, you must design them with a purpose. Meaning; if you’re okay with selling here and there and having sales that are a bit unpredictable, then create based on your mood. But if you want to design and launch products to be a part of a system that brings you consistent sales, you’ve gotta think like a big business. Choose the months you want to push sales, design products based on the month and plan product launches along with a marketing campaign. Math. Not my favorite subject but I know it’s extremely important when running a business. When I made a new product I would often compare it to my other products and price it based on whether it was a bigger or smaller size and what I thought people would think was a reasonable price. It wasn’t until I landed my first wholesale account (selling my items for 50% of the retail price) and realized I was barely profiting, that I had to get more strategic with my pricing. I knew I wanted to grow the wholesale side of my business and get my bags into multiple retailers but I also knew I couldn’t run a successful business with measly profits. It took even more time for me to realize there were many costs I wasn’t accounting for or covering. I didn’t really put a value on my time, think about how much I wanted to get paid per hour or what my profits needed to be for me to reach my dream goal of working on my handmade biz full time. I couldn’t just raise my prices to boost my profits and earn the hourly wage I wanted. I’d be pricing my products out of the market. I had to find ways to buy materials at wholesale prices, reduce my production time and be selective of what I spent my time on. Sell at a craft show I received an invitation to? It would normally be an immediate “yes!” and feeling flattered I was asked. But eventually turned into researching and making sure the crowd the event attracted was the same crowd that would be interested in my products and knowing the organizer had a good marketing plan in place. Even if numbers aren’t a strength of yours, don’t ignore them. Know exactly what’s being put into your business and what you’re getting out of it. Growing your following, increasing likes, posting more, etc. It can be gratifying to post a photo of your new product, get a bunch of likes, a few comments and maybe even see your follower total grow. But is any of it translating into sales? Social media can turn into a bit of a like-for-like playground. Other accounts like or follow your account in hopes of being noticed and getting a like or a follow back. Not great for sales. It can also be an easy way to support someone, without having to spend money. How many friends, family and followers like your photos vs. buy your products? A social media like is a nice ego boost but it doesn’t pay the bills. Social media has some of the lowest conversion rates when it comes to turning lookie-loos into actual customers. You know what type of marketing has a better conversion rate? Email marketing. You know what else attracts people who are more likely to turn into customers? Organic traffic through search engines like Google. That means, instead of spending hours posting to Facebook or tweeting on Twitter, your time would be better spent writing blog articles that boost your ranking in search engines, encouraging people to sign up for your newsletter and sending quality newsletters each month. ignite some passion. In the beginning, attending your first craft show and bringing home a full cashbox puts you on cloud nine. Once you settle into that phase, what’s the next step that will give you that “I can’t believe it!” feeling? Maybe getting into boutiques, expanding outside the province/state, being featured in your favourite magazine or even getting into a major retailer. If you’ve reached your capacity and no longer have goals to expand, what about branching into a different area? Adding new products to your line, working with new materials or even partnering with another business could be lofty aspirations. Dream big and be realistic about where you want to be in 1 or 2 years. If your goals don’t excite you, think again and set new ones. Continue to challenge yourself in your craft each day. Take new classes, learn new techniques, make new products and meet new people. Making the same products and going to the same craft shows becomes safe, easy and comfortable but that’s when we tend to get bored. It’s the reason people get sick of any job; they feel stagnant. They’re not striving towards a new promotion, achievement or goal and day-to-day tasks become mundane. I know it may seem a bit contradicting; on one hand I’m telling you to pay attention to the money and on the other saying it can’t be too important to you…but hear me out. You do absolutely need to be strategic and think like a business owner but you also can’t lose the passion behind your work or lack a deeper meaning. I get sucked into thinking what topic is going to drive the most traffic to my blog this week? But find that when I catch myself and remember why I’m running this blog and why I write my articles, ebooks and challenges, I create a much better product and in turn have a bigger impact on my readers. Instead of thinking about what you should make for an upcoming craft show, think about who your customer, how you want to impact them and what they would like to see. Where do you imagine your customer wearing, using, etc. your products and how do you want them to feel? Let that be focus and purpose behind each product, rather than pumping out stock to make a buck. At the end of the day, we all want to be happy. And when we really think about what makes us happy, they’re the things that excite us. Find ways to stay excited about your business each day to ensure it stands the test of time. Thanks for your article. I have been in the handcrafted business for 30 years and it’s always a struggle to find fresh ideas and enthusiasm. You are right, you have to be willing to adapt and change but it can be difficult. Thank you! Reading your article made me realise I am getting too comfortable in my business and relying on social media a little too much for my marketing. You inspired me to write a blog, send a email newsletter and set some new goals! Thanks for reading Martha, Joyce and Melanie! Martha, you may also be interested in this article: https://www.madeurban.com/blog/how-to-host-successful-craft-show/ where a bunch of vendors share what makes an event great for them 🙂 Good luck with your event! It sounds like an exciting new venture and I LOVE the cause you’re supporting. Joyce, I’m so glad you enjoyed the free 5 days to a standout display challenge. Being next to a vendor who has underpriced their work can definitely make it tricky to sell. In that situation, it’s important to point out your USP and the benefit of your products so shoppers understand why they’re priced the way they are and what they’re getting out of it. Good luck at your next event! Melanie, it’s easy to fall into a comfortable regime…I’m guilty of it too 😉 Good work getting your blog and newsletter started! Those a big tasks lots of small business owners skip but they can have a big impact. I participated in my first craft/handmade vendor show this weekend and had so much fun! Your articles have really helped to prepare me for the event. To go along with #7, something I did while at this event was keep track of ideas that the people who stopped by the tent were interested in. I had a DIY handout for a bug spray and a lot of people were interested in that, so I’m going to bring a couple to my next event. Another thing to consider with #7 is seasonal items. I really want to create rice heating packs, but it’s May and 80 degrees, so probably not appropriate. I’m going to wait until some of my fall and winter shows to roll those out and focus on ‘summer’ type items, like bug spray and after sun spray. Thank you so much for your content! I love checking out your site!